Many Americans fail to plan for the health events that commonly occur when they reach their 80s, 90s, or 100s. Researchers are working with older adults to develop a tool that helps them have a voice in what happens as their health needs grow. July 2016—As PCORI-funded studies produce results of interest to patients and those who care for them, we are updating the stories of those projects. Here is one such update. The team had created the site, PlanYourLifespan.org, to help older adults create concrete strategies for dealing with health crises that occur frequently with age, such as hospitalization, a serious fall, and memory loss or dementia. Older adults learn about what services they may need over time, what choices they can make now, and how to access these services when needed. The website also encourages users to talk about these plans with family members or other people they trust. The team’s initial evaluation—comparing older adults sent to either PlanYourLifespan.org or a control website—showed that the new website is effective in increasing planning, knowledge about support services, and communication about preferences. A woman describes a lively conversation about planning in a video from PlanYourLifespan.org, a website developed and tested in a PCORI-funded project. “Our website helps people plan for their fourth quarter of life—their 70s, 80s, 90s,” says project leader Lee Lindquist, MD, MPH, MBA, a geriatrician at Northwestern University. “This is a time when people need more help.” The site provides information about topics that older adults in the study’s focus groups identified as major life events that could affect their ability to live independently. Website users get a variety of practical information, including not only how to prevent falls at home but also tips on remembering to take medications, finding a caregiver, and planning which rehab facilities they’d prefer using, if necessary. Older adults helped the team prepare the site, developing the topics and text, as well as advising that the site needed high-contrast illumination and a large font for easy readability. This [website] is intended to give seniors a voice in their future. The project team intended to enroll 600 volunteers aged 65 and older, randomly assigning the volunteers to either PlanYourLifespan.org or a control website. The research team’s protocol called for interviewing the volunteers about their planning activities just before and after using the websites, as well as one and three months later. When the researchers performed their first analysis of data, after just 385 of the intended 600 participants had enrolled and begun using the websites, they found that compared with older adults who had used the control website, the people who had used PlanYourLifespan.org had made more plans for their future, had a better understanding of what they would need, and had communicated these plans with loved ones. The researchers stopped the study so that the website would be freely available to all the participants—as well as to the general public. Lindquist presented the findings during the plenary research talk in May at the Society of General Internal Medicine annual meeting. In 2017, Lindquist’s team received an additional PCORI award to train new partners in Chicago and Hawaii on disseminating and implementing PlanYourLifespan.org. After the website is in use in those communities for three months, Lindquist’s team will evaluate its effects. Members of Lindquist’s research team, including the patient partners and stakeholders, continue to get the word out on PlanYourLifespan.org. They have spoken at national medical, nursing, and social work conferences, universities, large companies, and groups for older adults. Users in 36 states have visited the website. It’s a scenario that plays out for many adult children: An aging parent is determined to stay in his or her own home and remain independent. Then a crisis occurs––an injury, a sudden hospitalization—or there’s a steady decline, and the parent can no longer manage without help. With support from PCORI, Lindquist and her colleagues, including retirees, are conducting community-based research to develop a tool called Plan Your Lifespan. The tool will focus on those life events that research has shown likely to cause older adults to need help to remain in their own homes. What Do Older Adults Need? In the first phase of the project, the researchers conducted focus groups with older adults and follow-up interviews with those supporting them (spouses, other family members, and friends) in communities ranging from urban Chicago to rural Indiana. The team recruited participants through partnerships with senior communities, home-care services, area agencies on aging, villages, and other organizations. The older adults shared their concerns about being able to remain in their homes, their views about and experiences with home-care services, and the extent to which they had discussed their long-term care plans with family members. Spouses, family members, and friends reported their worries about the older person’s future, any conversations about long-term care needs, and their readiness to make decisions with or for the older person when necessary. Older adults offered various reasons for delaying planning for their future health needs, says Chris Forcucci, a nurse with Aging and In-Home Services of Northeast Indiana and a community partner on the research team. “Some older adults procrastinate because they feel healthy, while others feel that they may die soon, so why bother planning?” she says. Some older adults procrastinate because they feel healthy, while others feel that they may die soon, so why bother planning? The focus groups highlighted some of the barriers that older adults perceive, says Lindquist. “Some older adults do not want to ask for help. Others worry a caregiver in their home would be intrusive. Many do not know how to find the services that would be helpful,” she says. 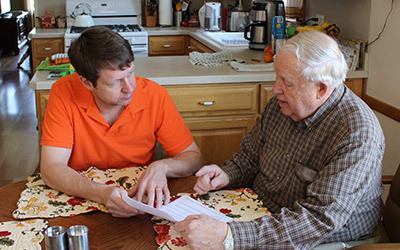 Often, the focus groups, sometimes held at senior centers, helped the older persons and those supporting them connect with services, as well as with other people having similar experiences. In the project’s second phase, now under way, Lindquist and her colleagues are creating an easy-to-use tool that will help older adults prepare for the unexpected events that can happen with age. The tool presents questions related to scenarios based on common health crises and provides information about options for future care. The tool connects users to home-care services, rehabilitation facilities, senior groups, and other local support services. The team is designing both electronic and paper versions of the tool. Lindquist says, “We want the web-based version to be easy to use and disseminate, while the paper version will enable older people who aren’t comfortable with computers to still benefit.” The paper version will provide mailing addresses and phone numbers, as well as web addresses, for home-care and other support services. Knowing that they are prepared provides them with a measure of confidence about their future. To test the tool, the researchers will assign each of 600 community-dwelling older persons to one of two groups. One group will receive the tool and be asked to complete a survey after using it. The other group will watch a 30-minute video on a topic related to staying in their homes. All participants will be interviewed again one month and three months afterward to determine whether the tool affected their willingness to plan for future health events, understanding of home-care services, and intention to discuss long-term care plans. “We anticipate that the tool will successfully enable older adults to make informed choices about their home needs and remaining in their own homes,” says Lindquist. If the trial shows the tool to be effective, the researchers will begin disseminating it nationally. Phyllis Mitzen, a 72-year-old semi-retired social worker, contributed to the original idea for the project, helped recruit participants, made suggestions about the wording of questions, and suggested topics that the focus groups should address. She says the researchers listened carefully and didn’t make assumptions about what older people need.